The barbaric incident happened on Thursday late night in Bhosh village in Morwa police station area of Singrauli district (700 km from Bhopal and 200 km from Varanasi). 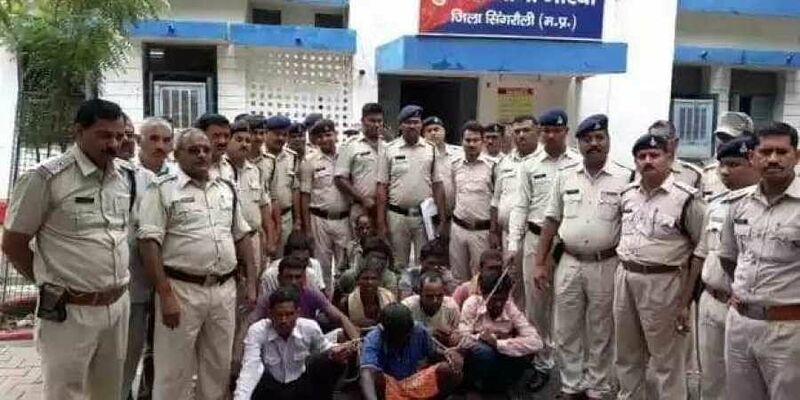 BHOPAL: As many as 14 tribal men have been arrested in Singrauli district of Madhya Pradesh for allegedly lynching a young mentally challenged woman, after suspecting her to be a child lifter. The barbaric incident which happened on Thursday late night in Bhosh village in Morwa police station area of Singrauli district (700 km from Bhopal and 200 km from Varanasi), when the woman aged around 25 years was caught by the tribals suspecting her to be a child lifter. With rumours being rife about child lifters being active in the district and adjoining areas, particularly following fake messages and videos over WhatsApp groups, the residents of Bhosh village suspected that the homeless woman was a child lifter. The woman was chased and after being caught, attacked by the mob of villagers with sticks and rods. They didn’t stop there but then inflicted deep wounds with a pick-axe. After killing the woman, the villagers dumped the body in a culvert in the jungles of Bargad, situated close to the Bhosh village, where she was allegedly lynched. According to Morwa police station in-charge Narendra Singh Raghuvanshi, a tribal man spotted the woman’s body near the forest department’s nursery in Bargad jungles on Friday evening, after which he reported it to the police. “We rushed a police team to the spot and recovered the body and began investigations which led us to the Bhosh village. A case of murder was lodged on Saturday and subsequent probe led us to the villagers who lynched the woman suspecting her to be a child lifter,” Raghuvanshi told The New Indian Express. As many as 14 accused, including a man identified as Hira Singh, who assaulted the woman with a pick-axe have been arrested till Sunday late night. The arrested men are aged between 25 and 50 years. “It’s possible that 5-6 more men might be involved in the crime. We’re in the process of identifying them also,” said Raghuvanshi. The incident happened more than two weeks after five men were lynched by a mob over child lifting rumours in Dhule district of Maharashtra. In Singrauli district of MP only, nearly a month back, a behrupiya (impersonator) was attacked by a mob, suspecting him to be a child lifter in Manda area. Rumours of child lifters roaming in the jungles of tribal MP have been rife, particularly in the wake of fake videos and messages over social media. The police has been alerting the villagers about not believing in rumours, but still the incident happened on Thursday late night.